It will come as no surprise to many that Scotland is not the only country that distils whisky…it’s just where it was perfected. Joking aside, the origins of alcohol of distillation can be traced back to ancient Egypt, although back then it had a medicinal purpose, the name alcohol is derived from the Arabic ‘Alkohol’. Supposedly the skills of distillation were brought to Europe from the Crusades in the 11th and 12th centuries. There is evidence of distillation taking place in Ireland from the late 12th century during an invasion by Henry II when there were encounters with the drink. Distillation does not appear, officially, in Scotland until 1494; King James IV instructing Friar John Cor to make aquavitae (a term for Whisky) from eight bolls of malt. However, it has been suggested that the clan McDonald on Islay had knowledge of distillation much earlier than 1494. When Àine nì Chathàin (Agnes o Kane from Derry/Armagh) marries Aonghas Òg de Yle, of the clan McDonald on Islay, Àine brings from Ulster the MacBeatha family (known in Scotland as Beaton), who become doctors for some major Scottish families and in their possession was the knowledge of distillation for the use as a surgical spirit. Regardless of who established distillation first, in the 19th century, Ireland’s whiskey dominated the market with around 50 distilleries in the mid-nineteenth century; now there are 18 Irish distilleries while Scotland has over 120. Prohibition swept through Europe and the USA and the partitioning of Ireland deprived Irish distilleries of the British Empire’s market, resulting in the decimation of Ireland’s whiskey industry. Irish whiskey is enjoying growth again and last year I had the pleasure of visiting a few distilleries, Teelings and Great Northern (a juggernaut of a distillery producing an incredible range of great spirit). In light of this, it felt worthwhile to note the key differences that exist between Irish whiskey and Scottish whisky. Irish whiskey is spelt differently, this is because in the 19th century Dublin distillers did not want to be associated with the poorer spirit that was being produced in Ireland, so they started inserting an ‘e’ to differentiate the brand. Where Scotch whisky produces Malt and Grain whisky, Ireland produces this and Irish Pot Still, which is made from malted and un-malted barley. Ireland is synonymous for Triple distillation, using a wash still, low wine still and spirit still while in Scotland most distilleries use double distillation which means only a wash still and spirit still are utilized. Triple distillation produces a lighter spirit by removing low volatility compounds present in heavier spirits such as Scotch, the spirit can be 30% higher in ABV than that of Scotch and the character can be smoother too. However, Irish pot stills are much larger than Scottish stills leading to limited copper contact resulting in a spirit with more sulphur and meaty flavours – the extra distillation and a purifier will work to reduce these undesirable flavours but in contrast Scotch’s smaller stills enjoy greater ‘reflux’ which provides more desirable flavours associated with copper contact and the removal of undesirable flavours. Ultimately, this can come down to taste preference because by increasing the amount of distillation/rectification and trying to make ABV as high as possible the distillers simultaneously reduce the volatile congeners/flavour compounds and character. The production of a lighter spirit, through Triple distillation, aspires to remove the less volatile flavours from the spirit and so there are sweeter more fragrant notes in the finished new spirit. Irish whiskey sources its barley only from Ireland and they can use un-malted barley which costs less than malted barley and provides a different flavour profile. 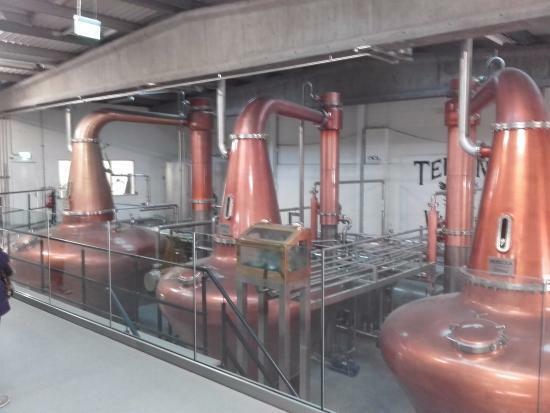 Auchentoshan in Scotland has used Triple distillation and Cooley Distillery in Ireland uses Double Distillation so there are exceptions to the common assumption. Cooley also offers peated malt which is contrary to the Irish typical spirit character of being light and containing no peat.